Look at me! 50% off! Limited Time Offer! Look how cool I am, I take pictures of macaroons! I don’t know about you, but the constant barrage of “look at me” marketing (sometimes thinly-veiled, sometimes not) is exhausting and annoying. If you’re in the online entrepreneur space, you’ve probably seen all the affiliate marketing and launch announcements filling your inbox. Free challenge after video series after launch-price-only content fatigue! If you’re an online entrepreneur, I know you want to create authentic relationships with your customers and you have products and services you want to get noticed. But how do you do that without being icky and shouting for customers to notice you? What if you did something different, by seeking out and noticing THEM? It feels good to be seen and recognized by the business or person whose content you’re consuming. Think about it - a fan is a fan. Would you be thrilled and lose your mind if your favorite band (author, podcaster, tv show) re-posted something you shared about them on social media? ps - here's my favorite fan moment, even though I was an employee...and no, I didn't tweet this myself. You might not be an actual Rockstar (as in people pay you to hear you play music on stage), but the fans who consume your content and buy from you are your fans. Talking with them, asking questions, authentically caring about what they need and share with you - these are the keys to creating relationships with people who will talk about you to their friends and peers over and over again. What is the solution you are providing to a problem your fan has? Do you offer a product or a service? Are you providing knowledge that will better their life? Instead of simply listing the features and benefits of your solution, make sure you illustrate clearly how their life/business will be BETTER with your solution. How will they feel? How will their day go? How will this impact their bottom line? *confession: I struggle with this the most! Whenever I start a sales/landing page, this first draft is usually a list of features/benefits because it’s so obvious to me how it helps I forget I need to illustrate it. Pro-tip: When you are listing the features/benefits of something you offer, insert the phrase, “So you can…or, So that...”. Where are your fans hanging out? Instagram? LinkedIn? If you are clear on who your target audience is, you can determine which social media networks to use for your brand. Follow other businesses in the same industry that you consider to be a level or two above you. Notice who is engaging with them and do a little investigative work on who they are and their business. These are people who are likely to be interested in your business as well! It gets old to only see a business post “ me, me, me” stuff. What if a business reached out to YOU and asked how they can help you better? Pretty novel huh? Look for hashtags around subjects in your industry and offer feedback or help - you’d be surprised how unexpected and refreshing this is for people! 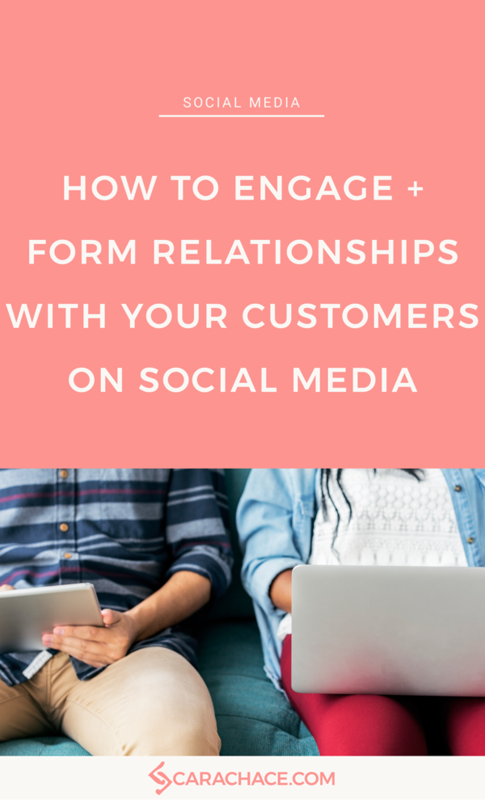 The engagement doesn’t stop when you get someone to opt-in to your email list or buy from you. I now implement a 2-question form in all of my introductory emails. I politely ask them to answer a simple Google Form with 1) What is your business/industry? And 2) What is your biggest struggle with social media and digital marketing? Not everyone responds - but I do get responses that help me understand my audience better and what they need! You likely have a bunch of complementary businesses/industries that you can relate to. You might find these people via a mastermind group, local meetup, around a hashtag on Instagram, students in an online course, etc. Your peers are great collaborators for projects, sounding boards for ideas, and cheerleaders. Some of them might turn out to be great friends. When you make the effort to form relationships with your peers, you are going to have a team of people that would love to share what you have going on with their own fans. Launching your service/product is a necessary part of online business - so how do you do this in a way that’s going to create buzz and more fans? Feature client testimonials and tag them. Feature your fans that have engaged with you as part of the problem/solution conversation. Share their stories, their businesses, their unique perspective. Create welcoming place (landing page, Facebook Group, etc) where your fans can engage and get to know each other, not just you! Ask your fans for their social media accounts, follow and engage with them there. Again, one more time...make your business campaign or launch about your FANS, not just you. Launching is HARD. It’s nerve-wracking and personal. I can help you wrap your head around the steps you need to take plan your content around your launch in my free content planning video series. There are many ways to create engaging fan relationships off-line that are going to transfer to social media. People love Instagramming a photo of something special and personal they received from you or writing online reviews/testimonials. If they’re a customer, make sure you are following up with either a personal email or a hand-written thank you note. If you have a brick and mortar store, invite people to check-in online and share their pics using your hashtag so you can continue the conversation with them. I have to share an amazing example of an offline series of events I just had with the author Mike Michalowicz. I bought the Kindle version of his book “Profit First”. It was so good and resonated with me so well, I bought a hard copy version so I could have it easily accessible to reference and to mark up with post-its and highlighting. Then I decided to buy another of his books, “The Pumpkin Plan”. Because I am mindful of expenses and had just paid twice for “Profit First”, I bought a used version from an Amazon reseller. There was a note in one of the books, that Mike was surprising me by upgrading my “Pumpkin Plan” book to a brand new copy, instead of used, and he was including “Surge” as a gift. He asked humbly and politely if I would submit a review of any of his books on Amazon. You’d better believe I’m Instagramming the shiznit out of this, writing reviews of all the books once I read them, and buying any book he publishes in the future. While I’m no longer focused on general social media (you can read more about why here), I AM offering tons of resources - like content planning and blog marketing, plus other tools to make entrepreneurship easier - in my Free Rockstar Membership for Pinterest PowerUp. PPU is a membership community for online entrepreneurs and the only Pinterest marketing resource you will ever need for your business!